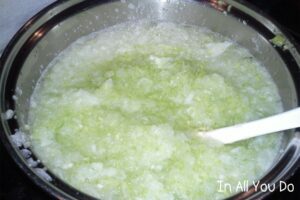 One of my favorite parts about Thanksgiving is my grandma’s dressing. For years I have loved her dressing! Since hers has long since been my favorite, no one else’s compares. About 5 years ago, the Hubster found a Maple Butter Turkey recipe he wanted to try, so she came over and taught him how to clean and cook the turkey. Then, she taught him how to make “her” dressing, but with the Maple Butter drippings. Since then, we have been asked several times to bring the dressing to Thanksgiving dinner. 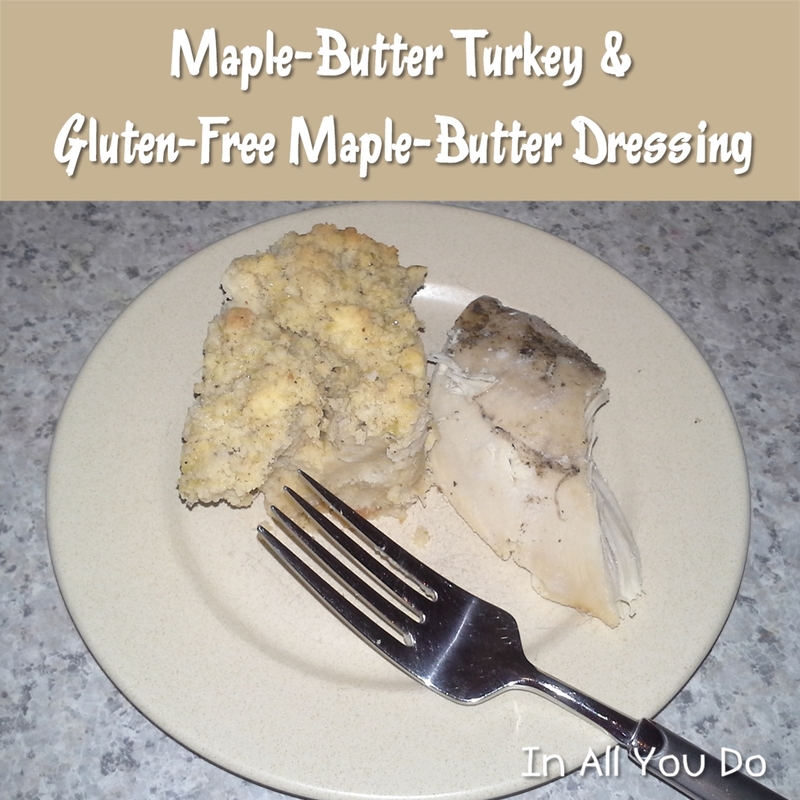 A delicious, moist, not-to-sweet turkey and dressing that will simply melt in your mouth. For maple butter, in a small heavy saucepan, bring cider and syrup to a boil. Put turkey in 18-22 quart roaster. With fingers, loosen skin over breast of turkey. and rub it all over the turkey (probably a tablespoon over the whole turkey). rubbing the inside with it as you put it in. with the lid and foil (folding the foil down around the edges of the roaster). COVER UNTIL AT LEAST 3 HOURS have past. Cube and toast the cornbread. 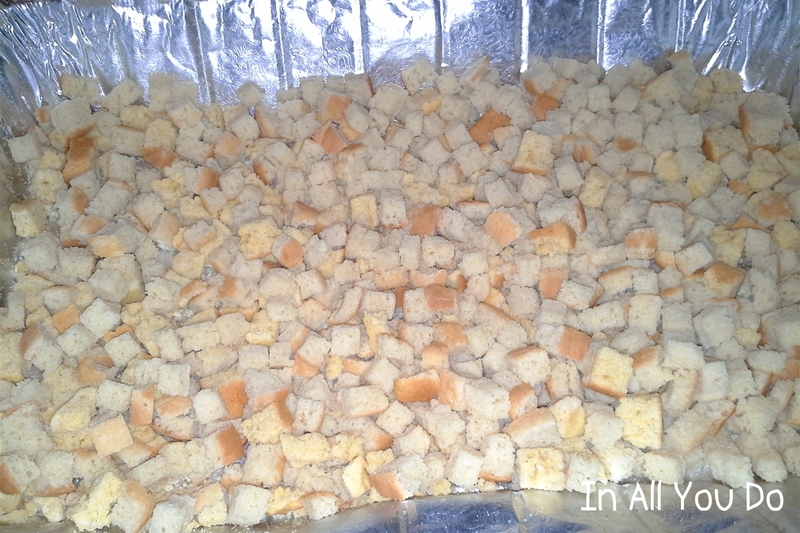 About 1inch cubes toast in oven on 200 until they feel crispy – but only slightly brown. Cube and toast bread. 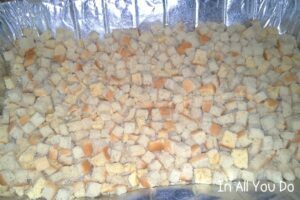 Make them about the size of sugar cubes, then toast in the oven on 200 until they feel crispy – but only slightly brown. 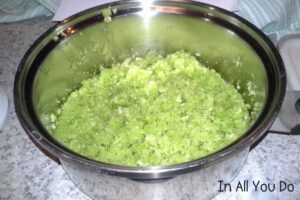 Chop celery in the food processor. 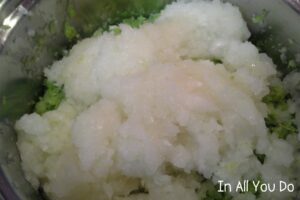 Chop onion in the food processor. 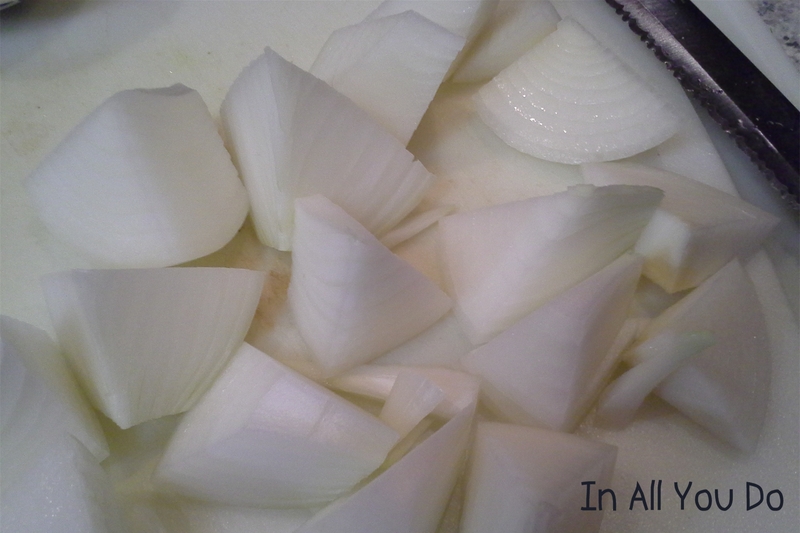 Combine celery and onion in a 3-qt pot and cover with just enough water so it can simmer for 10 minutes or so. 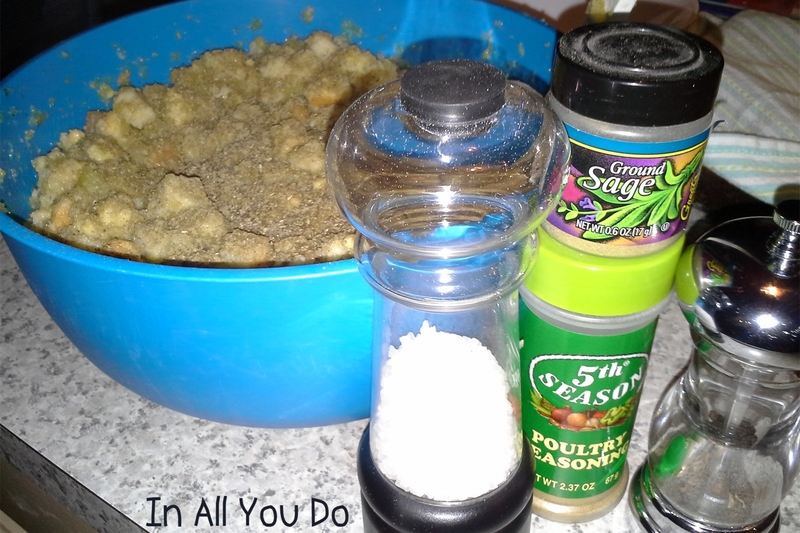 Put all ingredients (except sage and poultry seasoning) together in your largest mixing bowl. Add all the remaining drippings you saved from the turkey. Lightly stir so you don’t break up the bread, otherwise it will get mushy. Use a spatula, rather than a spoon. It helps keep you from stirring too hard and making it mushy. Add ladles of broth you made from the neck and giblets until it’s nice and moist – but not runny. Sprinkle the top with a light portion of Poultry seasoning (a light sprinkling over the whole top portion (in the bowl) will probably be just enough). Sprinkle about 1 tsp (to start) of ground sage over the top. Now pour the egg (already beaten) over the bread/celery/onion mixture. Lightly stir again being careful not to mush. 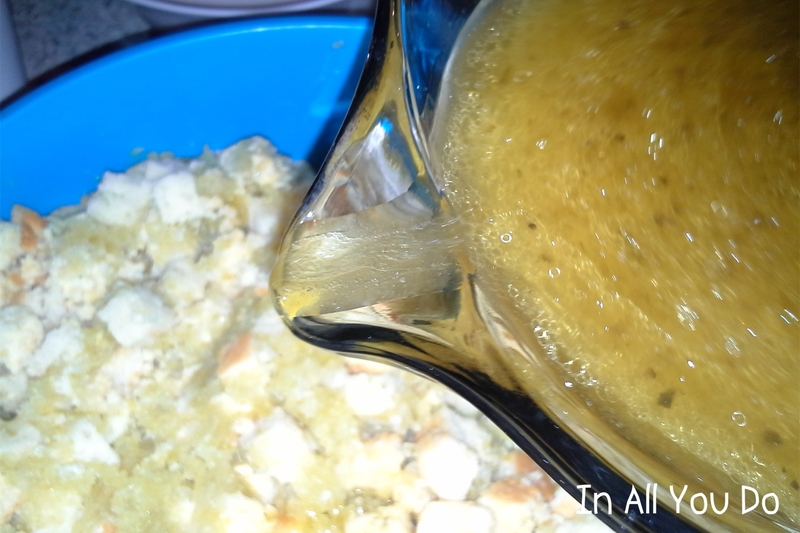 Pour and spread dressing into a large pan (a roaster pan works best – 9×13 will be too small). We always use a real roaster and not a foil one from the store, but that will work as well. 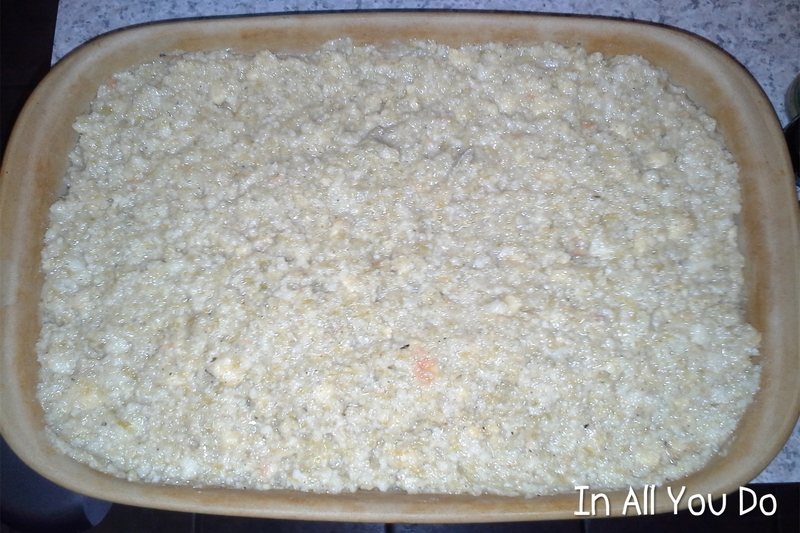 Put in refrigerator until needed, or cook immediately. 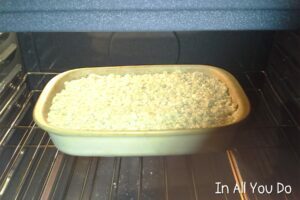 Cover with foil Heat at 350 for about 1½ hours till cooked through removing foil at 1 hour so that the top will brown and crisp. NOTE: If you cook the turkey and dressing ahead of time, make sure you save the skin of the turkey to lay over it in the fridge. It will help keep it moist when you re-heat. The dressing will keep with just foil over it. We usually cook both our turkey and dressing the day before and just re-heat it on Thanksgiving. Saves a lot of time and stress the day of Thanksgiving! But, I do have pictures of the Dressing!! And, oh how I love this stuff!!! 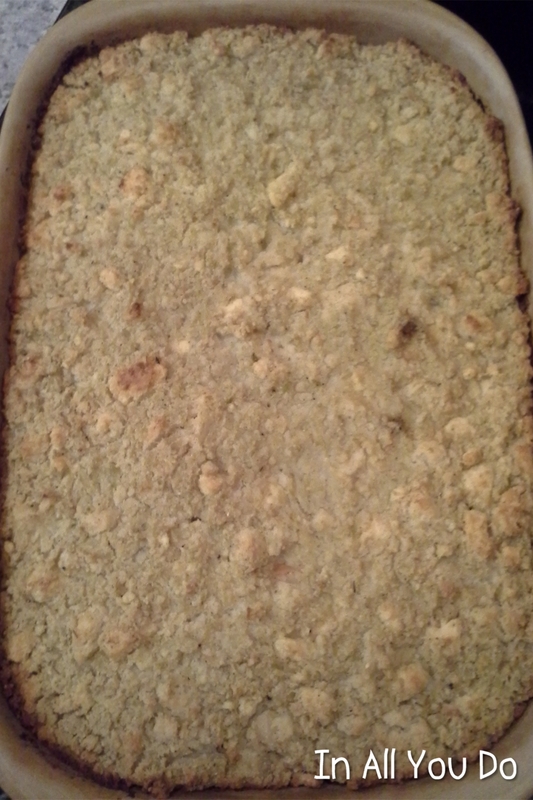 First, make sure you have baked the cornbread and allowed it to cool. 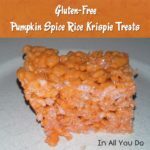 Once it’s cooled, cut it into 1″ cubes and put in roasting pan. Toast in the oven on 200 until they feel crispy and slightly brown. Don’t OVER COOK! 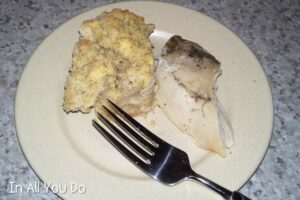 Then, cube and toast the bread the same as you did the cornbread. 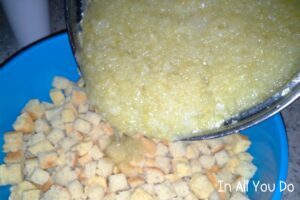 Once everything is toasted, pour them into a large mixing bowl and set aside. Chop celery in the food processor until fine. Now chop onions and grind them in the food processor until they are finely diced, but not mush. Add celery to 3-qt pan. Now add the onion on top of the celery. 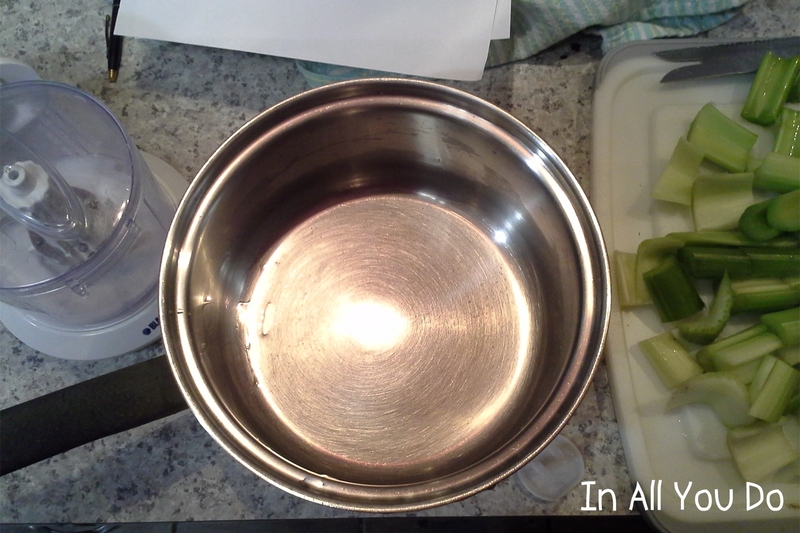 Pour enough water to barely cover the celery and onions. Stir to combine and simmer for 10 minutes. Once it’s simmered for 10 minutes, it should look like this. A little runny, but not soupy. 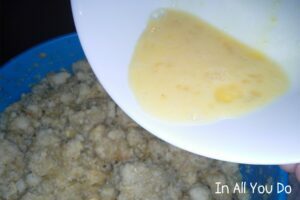 In large mixing bowl with bread cubes, pour celery/onion mixture over it. Next, pour in the remaining drippings you saved from the turkey. Stir gently, so you don’t break up the bread and it becomes mushy. If needed, add ladles of broth from the neck and giblets you boiled to make it nice and moist, but not runny. TIP: Use a spatula to stir rather than a spoon to help keep it from getting mushy. Now it’s time to add the spices. 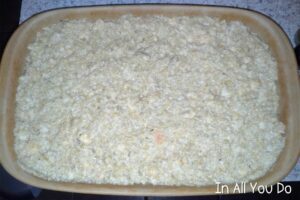 Sprinkle Poultry Seasoning over the top of the stirred mixture lightly and it should be just enough. Add 1 tsp of sage to the mixture (to start). 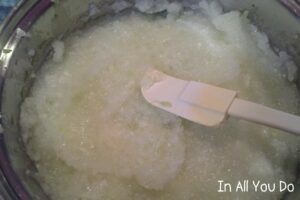 In a small bowl, lightly beat 1 egg and pour over the bread mixture. Stir gently to combine being careful not to make it mushy. 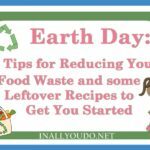 Now, at this point you can either cook it immediately (highly recommended) or cover with foil and refrigerate until you’re ready to cook it. We typically cook it immediately and then refrigerate it until we’re ready to re-heat it for the meal. When you’re ready to cook it, heat the oven to 350 degrees and bake for 1 1/2 – 2 hours or until thoroughly cooked. Cook the first 30 minutes covered with foil, then remove for the remainder of the cooking time. Removing the foil will allow the top to brown and crisp up just right. You can tell the dressing is done by testing the middle of the pan. 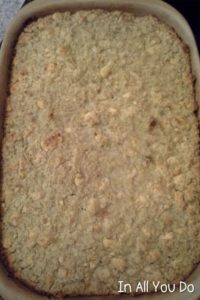 If it’s heated thoroughly and the top is lightly brown and crispy – it’s done!! Doesn’t it look delicious? 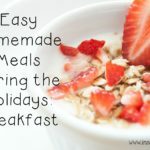 I was so excited that we “had” to make this early for my blog posting!!! 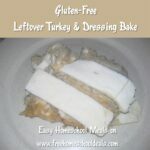 I’ve enjoyed the leftovers several times already too!! YUM!!! I can hardly wait for Thanksgiving and the rest of the goodies to go along with it. What’s your favorite Turkey recipe?